When a young Haitian girl named Emmanuella woke up in April 2018, her world was the usual blur. That day, Dr. Christine Bowman from Custom Eyes Family Optometry in Lancaster, Ohio, arrived in Haiti and began giving community eye exams. It would be Emmanuella's first eye exam and her first opportunity to see the world clearly. "Emmanuella's prescription is a -12 in her right eye and a -17.50 in her left eye," said Dr. Bowman. "We dilated her eyes and, of course, her retina had a stretched-out appearance. We gave her a pair of trial glasses and she was thrilled to see the letters on the eye chart. Her mother was so happy that her child could finally see." During one half day, the team examined 350 patients. As optometrists, there are many opportunities to make a difference. "The profession of optometry lends itself well to helping other people," she said. "I think it's awesome to help people who don't have access to health care. We did a lot of mission trips while attending optometry school and I love the fact that OGS travels to different countries to show support." Dr. Bowman was able to incorporate experiences in Haiti back to her practice. She has been studying about the importance of myopia control, how digital screens contribute to myopia, and how half of the population will have myopia by 2050. "This experience made me think about people with myopia who don't have access to eye care. It would mean not being able to drive, or learn at school. Having a global perspective has helped me look at the realities of myopia in a different way," she said. Her experience on the trip will make it easier to encourage the office and patients to support the next World Sight Day. "We have photos and stories that we can share," she said. "People's stories make the difference. When there is a name and a face, it makes the story a lot more personal and the connection is more tangible.' These experiences will make a difference when we ask for support in October for World Sight Day." There were a few challenges that occurred during the trip. "The weather was extremely hot and there was a lack of electricity, but I loved Haiti, it was Africa meets Latin America," said Dr. Bowman. "We had a lack of access to equipment that consistently worked and the language barrier was sometimes a struggle," she said. "Optometry Giving Sight and Vision Source worked together to successfully manage the sheer volume of patients. I found joy being out of my comfort zone, to be able to make a difference in our profession." Haiti has the highest level of blindness and vision impairment in the region and most of this is avoidable. It is three time higher than other countries in the region. An important reason for this is the critical shortage of qualified eye care personnel. In a country of over 10 million people, there are only three local optometrists. On April 12, 2018, Haiti’s first ever School of Optometry & Vision Sciences at the Faculty of Medicine and Pharmacy of I’Université d’État d’Haïti opened. Dr. Bowman participated in the ceremonies. "This school includes first-year classes with the pharmacy and medical students. The school still needs optometry professors. "The clinic is across the street from where the students will take classes, said Dr. Bowman. "The building was created after the Haiti earthquake; it will be a nice setup once completed." Working with the kids, as well as the optometry students was one of Dr. Bowman's favorite parts of the trip. "I loved that our first clinical experience was performing clinical outreach, explaining to the students through real life experiences that eye health and eye exams are important," said Dr. Bowman. "The students were getting real life training; it wasn't in an office, selling glasses. This made a big impact." Charity Vision, a non-profit with a local network in Haiti, have nurses that perform child lens refraction exams. 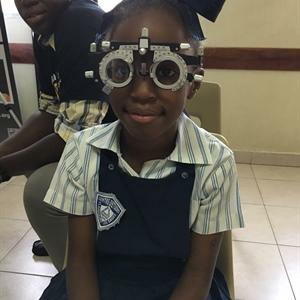 "Now that Charity vision has Emmanuella's perscription on file, they can always check and see if she needs an update as well as a new pair of glasses," said Dr. Bowman. "Her mother now knows that she needs glasses and will be able to obtain another pair for between $2-$3." "Optometry Giving Sight (OGS) is an awesome organization and as Vision Source optometrists, it’s a program where we can all participate; it is so worth supporting," said Dr. Bowman. "They are training their own people to take care of their own population. The building is now there and the students are there, but they still need equipment and professors. We can all give financially from home. This is an organization that is sustainable and creates jobs. As optometrists, we are here to serve globally and locally as optometrists."